Not ready to subscribe yet? Become a site member and read 3 free articles per month. 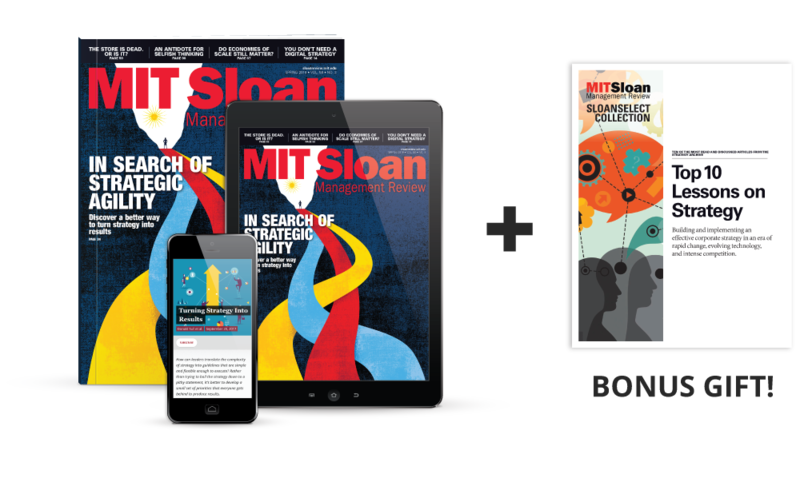 Subscribe now for as low as $5.75 per month — a 17% savings! Let the ideas, frameworks and insights from MIT SMR help you to lead productive change in your organization. The inventive yet practical knowledge you'd expect from MIT, now yours across all your digital devices. Choose an All-Access or Digital-Only subscription. The MIT SMR Automatic Renewal Program ensures you uninterrupted service: at the end of your subscription term, you will be automatically renewed at the rate then in effect, unless you tell us to stop. You won't be bothered with any renewal notices in the mail; instead, you will receive a clearly marked reminder before your credit card is charged. You may cancel auto-renewal at any time by contacting customer service via email or by calling us at 855-259-1782 in the US or International: 903-636-5279. You will receive a full refund on the remaining unused portion of your subscription. Yes! Please start my subscription for the term selected below. *Pricing for US delivery. Select your country from the form to view international pricing. $69 - save 17%. All of the above minus the quarterly print edition. Please automatically renew my subscription using the credit card provided.